The crude soybean oil still contains many oil-insoluble and oil-soluble impurities that needs to be removed. 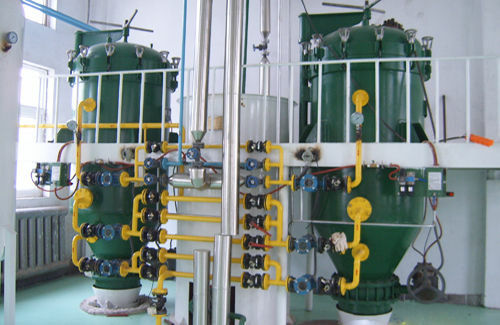 Soybean oil refining including degumming (removing of phosphatides), alkali refining (washing with alkaline solution to remove free fatty acids, colorants, insoluble matter and gums) and bleaching (with activated earth or activated carbon to remove colour and other impurities. Crude soybean oil is normally defined in terms of moisture and dirt, phosphatide content normally expressed as ppm phosphorus, free fatty acids (FFA) or acid value and also in terms of color, oxidation characteristics, and trace components such as iron and copper. 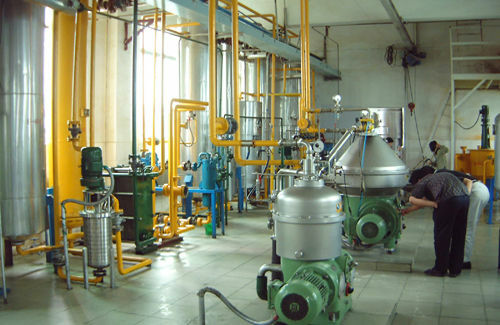 According to the different uses of soybean oil (food and non- food uses) the soybean oil refining process is different. The specifications of the R.B.D. will be more definite and difficult to obtain for the margarine industry, mainly for the Distributive Trade Market. In fact, miscella refining is used almost exclusively with cottonseed oil and the zenith process(developed in SWEDEN) in the refining of rapeseed oil. In the U.S.A. and in Europe, for soybean oil refining, the caustic soybean oil refining process is by far the most used. The physical refining of palm oil, lauric oils and other fats and oils that have a low phosphatide content by dry degumming and bleaching followed by distillation, deodorization, is 20 to 25 years old and common practice today. But for the “soft” oils (soybean, sunflower, rapeseed, corn...) many oil refining experts still reserve their opinion and prefer caustic neutralization for soybean oil. - Cheaper initial investment in equipment. Welcome to email usanytime you are interesting in soybean oil refining, we are always at your service!